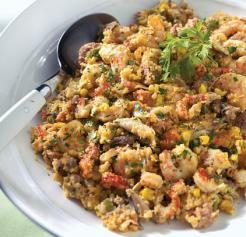 One of our favorite casseroles in South Louisiana is Cajun Cornbread Casserole. Cajun Cornbread Casserole is an excellent and versitile dish that we serve at Thanksgiving or Christmas but it can be adapted for Lent by eliminating the sausage. Also, it can be served as an entree or side dish. If you don't want to make your own cornbread or can't find the Pioneer mix, just buy what you can find but check the ingredients. You don't want to use a mix that has too much sugar in it thus making the casserole too sweet. Bake cornbread as directed per package instructions or make homemade cornbread. Crumble into a large mixing bowl. Melt the butter in a large sauce pan; add onions, celery, and bell pepper sauté mixture until the onions clear. Add crawfish tails, shrimp, sausage. Cook for about 5 minutes, stirring often. Add milk and cream corn, stir until mixture is fully blended. Fold all ingredients into the bowl of crumbled cornbread, along with eggs, cheese, and parsley. Mix well, season with Tony’s to taste, transfer to a baking dish, and bake it at 350 degrees for 45 minutes. Cajun food sounds very good to try out Greensboro Restaurant New Orleans Bar and Grill! OMG, Food is wonderful and so is the service.